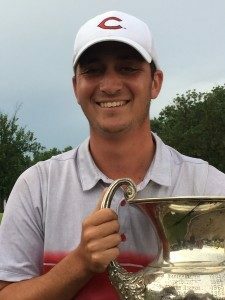 Sam Midgal, a former national champion golfer at Central Missouri, birdied his first hole after a three-hour rain delay and held on to beat Hunter Parrish 1-Up through the 36-hole match play final at the 2016 Missouri Amateur Golf Championship, Sunday at Jefferson City Country Club. Heavy rain and lightning arrived on the 12th hole of the afternoon session and play was suspended just after 3:00 p.m. After a three hour delay, Migdal birdied the 13th to go 1-UP. Parrish made a par putt to extend the match to 18, but missed a birdie putt to even the match. Migdal made his final putt for par to win the championship. Migdal reached the finals with 1 up win over four-seed Brad Nurski while Hunter moved to the championship thanks to a 1 up victory over two-seed Joey Johnson. Mizzou junior-to-be golfer Luigi Botta, was the tournament medalist, and earned the No. 1 seed in stroke play, but lost in the Round of 16 to 16-seed Wayne Fredrick 2 up. That now makes it 13 of the last 15 years that the top seed has failed to win the championship.